When you are focused on a project for several months, there’s nothing more satisfying than seeing the final work complete. As content creators, this is a feeling we know well. And we also know that we cannot have enough of it. That’s why we keep facing challenges that are more and more exciting. This is especially true for the latest project we’ve had the pleasure to work on. 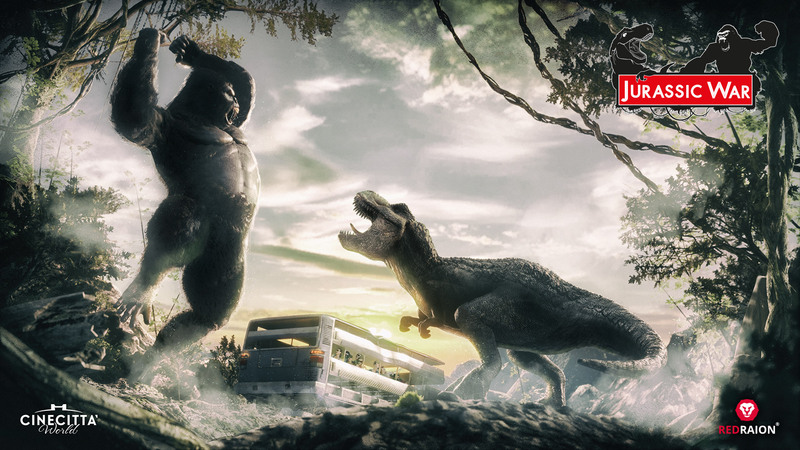 On May 19th, Cinecittà World, the Italian theme park that celebrates the history of cinema and television, inaugurated “Jurassic War”, its brand new immersive tunnel experience. As pointed out by Stefano Cigarini, CEO of Cinecittà World, during the press conference organized to announce the new attractions for the upcoming season, “Jurassic War” is going to be a crucial asset for the park in 2018. The immersive tunnel has been completely redesigned with a new tailor-made film created by us. “Jurassic War” pays homage to science fiction movies revolving around cloned dinosaurs: a cinematographic genre that has thrilled generations of spectators for a few decades now. A pre-show walk through fossils, animatronics and re-enactments welcomes the guests before getting on the vehicle that drives them into the heart of the jurassic forest, where the creatures live. 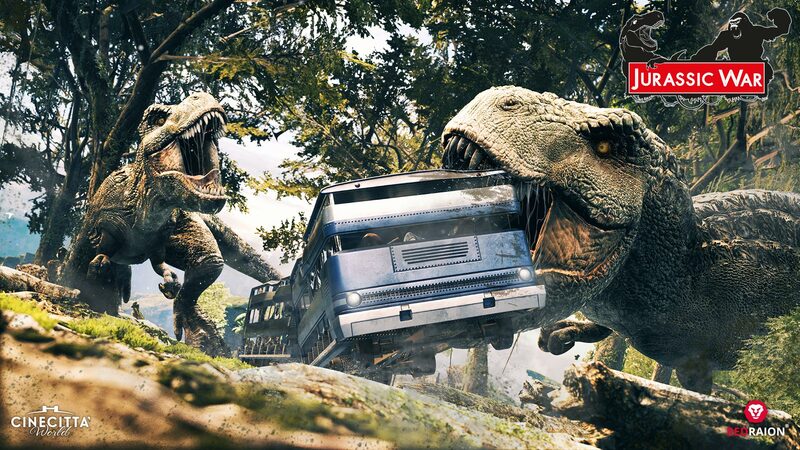 The tour is very calm and relaxed at first, but all of a sudden the wagons get pushed off road and they become the main target of the cruelest dinosaur: the Tyrannosaurus Rex. When everything seems lost, an unexpected ally comes to rescue. A modern attraction, for which there are only a few comparisons in Europe, as the specification sheet implies. The three wagons, that can carry up to a maximum of 90 guests, are surrounded by a round screen that is 70 meters long and 5 meters tall. The video resolution of the movie is 14976px × 1080px and has been CGI produced taking advantage of 7 stereoscopic cameras. The movements of the wagons have been synchronized by our team: this fusion between hardware and software grants an immediate response from the simulation platform, thus increasing immersitivity. A special mention for the audio system, which, thanks to its 21 channels, contributes to the overall realism of the attraction. To conclude, something that make us very proud about the video content of “Jurassic War”: the movie is 4 minutes and 40 seconds long and it is the longest film produced for an immersive tunnel experience in Europe. Do you want to know more about our approach to the design of custom-built movies? Subscribe to watch all of our movies in full-length and receive all the news about future releases!